Trekking the Annapurna circuit is something of a rite of passage for many hiking enthusiasts. Hidden away in the spectacular Annapurna Valley of the Nepalese Himalayas, the Annapurna Circuit takes hikers through some of the most stunning Nepalese mountain scenery you can find. You will also encounter fascinating Bhotia (Tibetan) culture, sacred temples and unique wildlife. Sounds amazing, right? If Annapurna Circuit sounds like the trek for you, here are the answers to the biggest questions you will have before embarking on this unforgettable Himalayan trek. First thing’s first, what exactly is this legendary trek? The Annapurna Circuit is a long-distance mountain trekking route in the Annapurna mountain range of the Nepalese Himalayas. The circuit follows two river valleys, encircling the Annapurna Massif to reach its high point at Thorung La pass, 5,416 metres, which is located right on the edge of the famous Tibetan plateau. The Annapurna Circuit has been voted the best long-distance trek in the world, because of its variation of scenery. You will begin trekking through Hindu villages, and climb up to encounter Tibetan culture, along with impressive gorges, scenic meadows, cascading waterfalls, crystal-clear lakes and spectacular mountain passes. Where does the Annapurna Circuit start and end? Many treks along the Annapurna Circuit begin in Pokhara, however, ours is a little different. In order to give Bucketlisters the most all-encompassing experience of the Annapurna region – and of Nepal – we begin in a mountain village called Khudi. We fly into Kathmandu, and then take a jeep along the roads to Khudi, where we begin walking. Then, we follow the trail to Jomsom, before flying from there to Pokhara to enjoy the lakes, and finally driving back to Kathmandu. 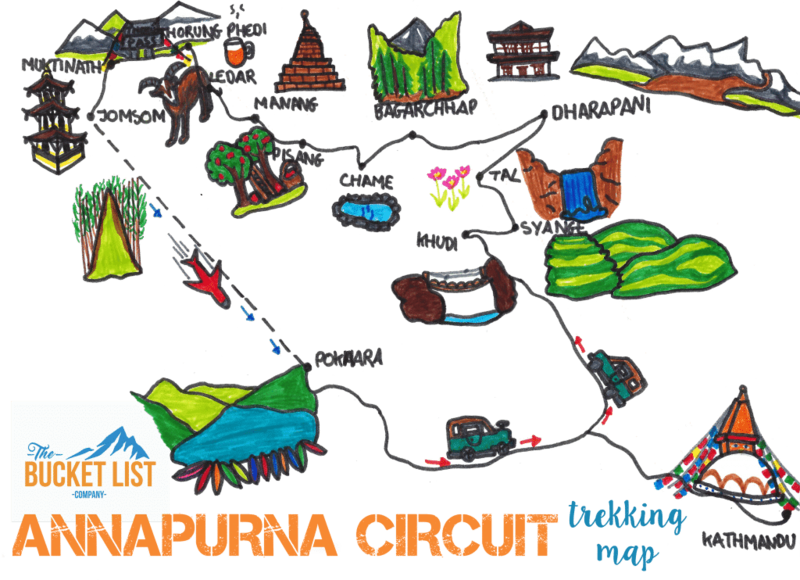 Take a look at our illustrated Annapurna Circuit trekking map above to get an idea of the route for the trek, and what you’ll encounter along the way. How long does it take to trek the Annapurna Circuit? Our Annapurna trek is a 16-day trip, involving 11 days of trekking – including one rest day in Manang. The remaining five days are for travel, and exploring the cities of Kathmandu and Pokhara. In total, the walking distance of our Annapurna Circuit trek is 230 km, with an average of 10 km of walking distance per day over around 6 hours. How high is Annapurna Circuit? The highest point on the Annapurna Circuit is at an altitude of 5,416 metres. This is actually the highest mountain pass in the world. The trek begins at Syange, which sits at 1119 metres, and ends at Jomson, 2720 metres. The total ascent of the Annapurna Circuit is therefore around 4300 metres, and the total descent around 2700 metres – although this varies with individual inclines and declines each day. As with any mountainous region, the weather on the Annapurna Circuit can be changeable. The climate of the Annapurna region goes from warm in the lower areas to cold and windy in the higher reaches, usually with snow on the high pass. It is located in a “rain shadow” area, meaning it actually receives a lot less rainfall than other parts of Nepal. Generally speaking, the best times to undertake the Annapurna Circuit trek are autumn and spring. These seasons allow you to avoid monsoons and trek in comfortable heat. 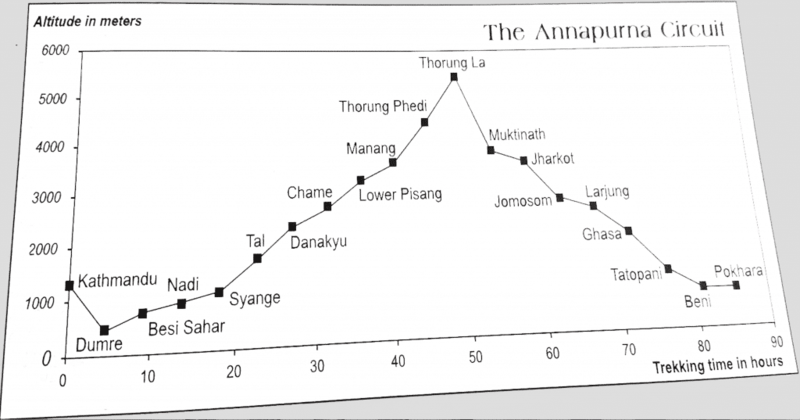 Below is a rough guide to temperatures at different elevations of the Annapurna Circuit trek throughout the year. Is the Annapurna Circuit hard? The answer to this question is, of course, subjective depending on your level of experience. As with any high-altitude trek, there will certainly be challenging moments on the trail, such as steep ascents and rocky tracks. However, the Annapurna Circuit should be achievable by anyone who is healthy and at a good level of physical fitness. This is a relatively long trek, so it is wise to train with some weekend hikes before you head out to Nepal. Do I need a guide for the Annapurna Circuit? Whilst it is not compulsory to have a guide for the Annapurna Circuit trek, it is strongly advised to go with an established guide – even if you are an experienced hiker. Local Nepalese guides have an unrivalled knowledge of the route, its challenges and variable. Whether it be knowing the logistics of managing the effects of altitude in the Himalayas, or something as simple as helping you arrange specific requirements with teahouses, guides provide invaluable support throughout the trek. One of the main questions we get asked about any trek is – what will I be eating? Getting your nutrition and hydration is fundamental for a successful trek, so ensuring you are consuming as much and the correct food and liquids is very important. On the Annapurna Circuit, you should not consume drinking water without treating it first. To avoid creating plastic waste, we advise Bucketlisters to bring chlorine tablets or filtering water bottles on the hike, along with a well-sized bottle. Treat all water before drinking it. Breakfast: Eggs (fried, boiled or posed), bread and cereals (porridge-oats, or muesli), plus tea and coffee. Lunch: Choose from fried noodles (spaghetti or chow mein), mixed fried rice. spaghetti with tomato sauce, pizza or fried potatoes with cheese. Side items include potatoes and vegetables. Served with tea and coffee. Dinner: Soup (mixed, vegetable, or chicken), followed by either noodles (spaghetti or chow mein), Nepalese dinner – dal bhat (lentil rice) with meat or vegetable curry, fried rice or momo (vegetable or meat dumpling), or yak steak with potatoes (chips or fried). Served with tea and coffee. Those who follow a vegetarian or vegan diet need not be concerned – if you let us know with plenty of time in advance, we can cater to any dietary requirement on the trek. In fact, most trekkers choose to follow a vegetarian diet whilst hiking in the Himalayas, because meat has to be carried from Kathmandu or Pokhara, meaning it is generally safer on the stomach to avoid it. If you’re thinking of ticking the Annapurna Circuit trek off your Bucket List, now is the time to do it! Contact us today to find out more about this epic trek on 01769309007.